Eldest son of playwright and poet Oscar Wilde, and Constance Lloyd Wilde, later Holland. 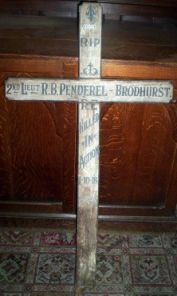 Original wooden grave marker, note the inversion of his intitials. Son of James George Joseph and Henrietta Lee Penderel Brodhurst, of Churchdale House, Harvard Rd., Chiswick, London; husband of Winifred Hadley (formerly Swain), of 3632, Third Avenue West, Vancouver City, British Columbia. Formerly 13th Kensington Bn. London Regt. and Artists' Rifles. James G. J. was a well known English author,and was also an editor of the Guardian newspaper in the early 1900's. Born in Wolverhampton, John resided at 92, Field Street, Bloxwich and was employed at Spottlebrook Colliery, Bloxwich. He enlisted in the Army at Lichfield in 10/1913 and was drafted to France on Tuesday 19/01/1915. On Saturday 18/07/1915 his bn relieved the Royal Welsh Fusiliers in trenches at Le Plantin for a period of four days. During this time losses amounted to three men killed and nineteen wounded. Born in Mansfield, Nottinghamshire, James was a single man who resided with his parents, Frederick and Mary Ann Hodson, at 59, James Street, Ryecroft. Enlisting in the Army at Walsall during 09/1914, he was drafted to France on Wednesday 18/08/1915 and was serving in trenches at Richebourg-L’Avoue, six miles north east of Bethune, when killed. “He was resting in a dug out which suddenly collapsed owing to the abnormal rains. United Kingdom Private 21858 Lancashire Fusiliers 17/03/1916 II. T. 10. 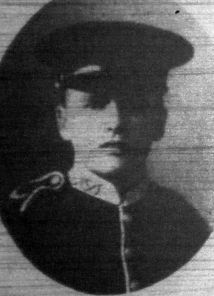 United Kingdom Private (Signaller) 16/682 West Yorkshire Regiment (Prince of Wales's Own) 27/07/1916 Age: 22 III. E. 15. United Kingdom Corporal 490850 London Regiment 17/02/1917 Age: 24 IV. D. 5. United Kingdom Acting Bombardier 19134 Royal Field Artillery 20/03/1916 II. U. 7. United Kingdom Private 307924 Duke of Wellington's (West Riding Regiment) 03/05/1917 Age: 23 IV. G. 6. United Kingdom Private 307740 Duke of Wellington's (West Riding Regiment) 09/04/1917 IV. F. 8. United Kingdom Private 2194 Suffolk Regiment 21/06/1915 Age: 41 I. F. 8. United Kingdom Rifleman C/3675 King's Royal Rifle Corps 19/07/1916 Age: 18 III. A. 12. United Kingdom Private 4286 Royal Warwickshire Regiment 16/12/1915 Age: 20 II. G. 10. United Kingdom Private 2647 Sherwood Foresters (Notts and Derby Regiment) 19/11/1915 II. E. 3. United Kingdom Lance Corporal 15/15 West Yorkshire Regiment (Prince of Wales's Own) 14/09/1916 Age: 29 II. X. 1. United Kingdom Private 11371 15th (The King's) Hussars 21/04/1916 Age: 21 III. C. 8. United Kingdom Serjeant 5483 Worcestershire Regiment 23/08/1916 III. H. 17. United Kingdom Private SD/3883 Royal Sussex Regiment 30/06/1916 III. B. 9. United Kingdom Private 12/1155 East Yorkshire Regiment 28/08/1916 III. M. 18. United Kingdom Private SD/1948 Royal Sussex Regiment 30/06/1916 Age: 26 III. K. 11. United Kingdom Private 17451 Royal Welsh Fusiliers 18/07/1915 Age: 23 I. J. 7. United Kingdom Private 10213 Hampshire Regiment 23/07/1916 Age: 26 III. L. 13. Indian Second Lieutenant 8th Gurkha Rifles 13/05/1915 Age: 20 I. B. 4. United Kingdom Serjeant 5801 Royal Warwickshire Regiment 16/12/1915 II. H. 1. United Kingdom Private 492315 London Regiment 03/02/1917 Age: 31 IV. C. 1. United Kingdom Private 17495 Cheshire Regiment 02/01/1916 Age: 25 II. K. 5. United Kingdom Private 13464 East Lancashire Regiment 16/12/1915 Age: 19 II. G. 8. United Kingdom Lance Corporal SD/3942 Royal Sussex Regiment 30/06/1916 Age: 21 III. T. 1. United Kingdom Serjeant 12339 South Lancashire Regiment 19/12/1915 Age: 23 II. H. 10. Indian Rifleman 2651 2nd King Edward's Own Gurkha Rifles (The Sirmoor Rifles) 28/05/1915 Indian C. 2. United Kingdom Private 17646 Cheshire Regiment 20/03/1916 II. U. 6. United Kingdom Corporal 46663 Royal Field Artillery 09/05/1915 I. A. 7. United Kingdom Private 13/870 East Yorkshire Regiment 06/08/1916 Age: 19 III. M. 16. United Kingdom Private SD/2865 Royal Sussex Regiment 30/06/1916 Age: 37 III. J. 11. United Kingdom Rifleman 3692 London Regiment (London Rifle Brigade) 02/11/1916 III. S. 11. United Kingdom Private 17152 Cheshire Regiment 02/01/1916 II. K. 7. United Kingdom Gunner 64364 Royal Field Artillery 22/03/1916 Age: 29 II. U. 12. United Kingdom Lance Corporal 15202 Hampshire Regiment 23/07/1916 III. E. 13. United Kingdom Lance Corporal 13109 The Loyal North Lancashire Regiment 05/12/1915 Age: 24 II. F. 6. United Kingdom Second Lieutenant East Lancashire Regiment 11/08/1916 Age: 24 III. N. 16. United Kingdom Private 41164 Worcestershire Regiment 03/09/1918 Age: 22 V. A. 1. United Kingdom Private 22872 Royal Welsh Fusiliers 14/01/1916 Age: 22 II. M. 1. United Kingdom Private 13844 Royal Welsh Fusiliers 22/03/1916 III. A. 1. United Kingdom Private 18/22 Durham Light Infantry 03/08/1916 Age: 30 III. G. 16. United Kingdom Private 267440 Duke of Wellington's (West Riding Regiment) 13/05/1917 Age: 29 IV. H. 1. United Kingdom Lance Corporal SD/1952 Royal Sussex Regiment 30/06/1916 III. P. 2. United Kingdom Private 14141 King's Own (Royal Lancaster Regiment) 14/12/1915 II. G. 3. United Kingdom Private 3/3694 Black Watch (Royal Highlanders) 21/07/1915 Age: 38 I. J. 2. United Kingdom Private SD/2866 Royal Sussex Regiment 21/06/1916 Age: 21 III. M. 5. United Kingdom Lieutenant Royal Field Artillery 04/06/1915 Age: 25 I. E. 9. United Kingdom Private 8710 Leicestershire Regiment 24/06/1915 Age: 27 I. G. 1. United Kingdom Private 6610 Duke of Wellington's (West Riding Regiment) 12/03/1917 IV. E. 6. United Kingdom Private 307241 Duke of Wellington's (West Riding Regiment) 05/04/1917 IV. F. 6. United Kingdom Private SD/2078 Royal Sussex Regiment 30/06/1916 Age: 20 III. C. 12. United Kingdom Private 2108 Cambridgeshire Regiment 30/06/1916 Age: 19 III. L. 10. United Kingdom Private 2793 Gloucestershire Regiment 13/07/1916 Age: 20 III. J. 12. United Kingdom Private 11609 Highland Light Infantry 16/05/1915 I. C. 4. United Kingdom Private 21174 South Wales Borderers 06/02/1916 II. O. 5. United Kingdom Private 268555 Duke of Wellington's (West Riding Regiment) 09/04/1917 IV. G. 1. United Kingdom Corporal 54772 Royal Field Artillery 25/05/1915 Age: 21 I. C. 8. Indian Sepoy 4472 15th Ludhiana Sikhs 19/05/1915 Indian. A. 1. United Kingdom Private 28198 Sherwood Foresters (Notts and Derby Regiment) 23/07/1916 III. H. 12. United Kingdom Gunner 73377 Royal Field Artillery 20/12/1916 IV. A. 8. United Kingdom Private 26215 Machine Gun Corps (Infantry) 31/05/1916 Age: 23 III. K. 6. Indian Sepoy 587 28th Punjabis 26/09/1915 Indian. B. 6. Indian Sepoy 2369 89th Punjabis 25/09/1915 Indian. D. 4. United Kingdom Corporal SD/2845 Royal Sussex Regiment 30/06/1916 III. G. 10. United Kingdom Private 22105 Manchester Regiment 08/05/1916 III. F. 1. United Kingdom Private 12/904 East Yorkshire Regiment 11/08/1916 Age: 41 III. Q. 17. United Kingdom Private SD/3525 Royal Sussex Regiment 30/06/1916 Age: 29 III. S. 5. United Kingdom Lance Corporal 27541 Machine Gun Corps (Infantry) 26/07/1916 III. B. 14. United Kingdom Private 512838 London Regiment (London Scottish) 09/02/1917 IV. C. 8. United Kingdom Private 280736 London Regiment (Royal Fusiliers) 10/02/1917 IV. C. 4. United Kingdom Private 17854 Wiltshire Regiment 19/12/1915 II. H. 12. United Kingdom Lieutenant Worcestershire Regiment 10/10/1916 Age: 23 II. ZI. 1. United Kingdom Rifleman C/3289 King's Royal Rifle Corps 15/07/1916 III. P. 12. United Kingdom Private 12/1514 East Yorkshire Regiment 24/07/1916 Age: 28 III. C. 14. United Kingdom Private 267459 Duke of Wellington's (West Riding Regiment) 12/03/1917 IV. E. 4. United Kingdom Private S/5040 Black Watch (Royal Highlanders) 11/07/1915 Age: 23 I. C. 10. Indian Lieutenant Colonel 123rd Outram's Rifles 25/09/1915 Age: 44 II. A. 2. United Kingdom Private 13/100 York and Lancaster Regiment 11/08/1916 III. K. 17. United Kingdom Corporal 18324 Welsh Regiment 04/12/1915 Age: 28 II. F. 4. United Kingdom Private 12953 East Lancashire Regiment 21/02/1916 Age: 19 II. Q. 3. United Kingdom Private 13500 The Loyal North Lancashire Regiment 13/03/1916 Age: 20 II. T. 6. United Kingdom Private SD/1007 Royal Sussex Regiment 23/07/1916 Age: 26 III. O. 13. United Kingdom Private 16378 Manchester Regiment 09/08/1915 II. B. 5. United Kingdom Private SD/1796 Royal Sussex Regiment 30/06/1916 Age: 32 III. P. 10. United Kingdom Second Lieutenant Royal Welsh Fusiliers 10/02/1917 Age: 21 IV. C. 2. United Kingdom Corporal 6379 East Lancashire Regiment 18/12/1915 Age: 18 II. H. 3. United Kingdom Private 15817 South Lancashire Regiment 17/12/1915 Age: 31 II. G. 11. United Kingdom Sapper 47096 Royal Engineers 29/03/1916 Age: 22 III. A. 6. United Kingdom Private 3105 Sherwood Foresters (Notts and Derby Regiment) 24/11/1915 II. E. 6. United Kingdom Private 43187 Worcestershire Regiment 03/09/1918 Age: 19 V. A. 2. United Kingdom Corporal SD/1273 Royal Sussex Regiment 30/06/1916 III. N. 6. 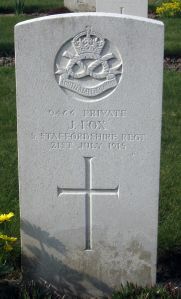 United Kingdom Private 17/600 West Yorkshire Regiment (Prince of Wales's Own) 08/05/1916 Age: 24 III. E. 3. United Kingdom Rifleman R/17377 King's Royal Rifle Corps 15/07/1916 Age: 20 III. N. 11. United Kingdom Corporal 14136 South Lancashire Regiment 17/12/1915 II. G. 6. United Kingdom Private SD/4950 Royal Sussex Regiment 30/06/1916 Age: 33 III. A. 9. United Kingdom Private SD/1275 Royal Sussex Regiment 30/06/1916 Age: 20 III. P. 5. United Kingdom Private SD/3885 Royal Sussex Regiment 30/06/1916 Age: 20 III. R. 9. United Kingdom Private 11923 South Lancashire Regiment 25/03/1916 Age: 30 III. A. 5. United Kingdom Private 23250 Cheshire Regiment 26/05/1916 III. H. 8. United Kingdom Private 1024 London Regiment (Royal Fusiliers) 16/05/1915 I. B. 8. United Kingdom Private 17600 Cheshire Regiment 27/12/1915 Age: 23 II. J. 6. United Kingdom Private 19558 Gloucestershire Regiment 30/06/1916 III. M. 10. United Kingdom Second Lieutenant Northumberland Fusiliers 09/05/1915 Age: 18 I. E. 6. United Kingdom Private 31973 Sherwood Foresters (Notts and Derby Regiment) 12/06/1916 III. L. 7. United Kingdom Gunner 21042 Royal Field Artillery 20/12/1916 Age: 33 IV. B. 1. United Kingdom Private 15206 North Staffordshire Regiment 21/01/1916 Age: 20 II. M. 12. United Kingdom Rifleman S/27384 Rifle Brigade 27/01/1917 Age: 34 IV. B. 8. United Kingdom Private SD/890 Royal Sussex Regiment 30/06/1916 Age: 28 III. O. 1. United Kingdom Private 21555 East Yorkshire Regiment 09/08/1916 III. G. 17. United Kingdom Serjeant 15205 North Staffordshire Regiment 18/01/1916 II. M. 6. United Kingdom Private 491779 London Regiment 17/02/1917 Age: 19 IV. D. 8. United Kingdom Serjeant 19993 Welsh Regiment 25/01/1916 Age: 23 II. N. 4. United Kingdom Second Lieutenant Duke of Wellington's (West Riding Regiment) 29/03/1917 Age: 20 IV. F. 3. United Kingdom Private 12/2009 York and Lancaster Regiment 10/09/1916 Age: 19 II. Y. 4. United Kingdom Lance Corporal 9205 South Lancashire Regiment 19/12/1915 Age: 26 II. H. 11. United Kingdom Private 12701 South Lancashire Regiment 12/12/1915 Age: 23 II. F. 12. United Kingdom Private 18346 Wiltshire Regiment 26/07/1915 Age: 24 I. H. 3. United Kingdom Private 15423 Lancashire Fusiliers 07/05/1916 III. D. 8. United Kingdom Gunner 3696 Royal Field Artillery 20/07/1916 III. D. 13. United Kingdom Private 12359 Cheshire Regiment 20/01/1916 II. M. 9. United Kingdom Private 12/1926 York and Lancaster Regiment 14/08/1916 Age: 21 III. D. 18. United Kingdom Corporal 26303 Royal Welsh Fusiliers 15/02/1916 Age: 18 II. P. 11. United Kingdom Private 11915 South Lancashire Regiment 25/03/1916 Age: 24 III. A. 4. United Kingdom Serjeant 15929 East Lancashire Regiment 06/08/1916 III. Q. 16. United Kingdom Private 13/55 East Yorkshire Regiment 23/08/1916 Age: 23 III. G. 18. United Kingdom Private 21711 Lancashire Fusiliers 24/03/1916 III. A. 3. United Kingdom Private 12593 Hampshire Regiment 30/06/1916 Age: 19 III. L. 9. United Kingdom Private 3350 Royal Warwickshire Regiment 15/07/1915 Age: 37 I. H. 9. Indian Rifleman 2911 4th Gurkha Rifles 12/10/1915 Indian B. 7. United Kingdom Lance Corporal SD/1583 Royal Sussex Regiment 30/06/1916 III. P. 7. United Kingdom Private 28515 Duke of Cornwall's Light Infantry 06/12/1916 Age: 38 IV. A. 4. United Kingdom Private 22506 East Yorkshire Regiment 06/08/1916 Age: 26 III. E. 17. United Kingdom Lance Serjeant 3323 London Regiment (Royal Fusiliers) 27/06/1915 I. F. 5. United Kingdom Private 19863 Cheshire Regiment 30/05/1916 III. J. 8. United Kingdom Lance Corporal 9714 Black Watch (Royal Highlanders) 11/07/1915 I. D. 10. United Kingdom Private 22111 Manchester Regiment 08/05/1916 Age: 36 III. E. 8. United Kingdom Private 3182 Sherwood Foresters (Notts and Derby Regiment) 02/12/1915 II. F. 2. United Kingdom Private 9933 Royal Warwickshire Regiment 06/09/1918 V. B. 1. United Kingdom Private SD/2875 Royal Sussex Regiment 30/06/1916 III. Q. 2. United Kingdom Private 24191 Royal Welsh Fusiliers 01/04/1916 III. A. 8. United Kingdom Private 18/902 West Yorkshire Regiment (Prince of Wales's Own) 30/07/1916 III. B. 16. United Kingdom Private 28715 Cheshire Regiment 20/03/1916 II. U. 5. United Kingdom Private 4093 Black Watch (Royal Highlanders) 02/07/1916 Age: 28 III. E. 12. United Kingdom Private 5058 Highland Light Infantry 25/04/1916 III. D. 3. United Kingdom Private SD/1670 Royal Sussex Regiment 30/06/1916 Age: 20 III. D. 10. United Kingdom Lance Corporal 493195 London Regiment 17/02/1917 Age: 38 IV. D. 6. United Kingdom Private 1620 Duke of Cornwall's Light Infantry 04/06/1916 III. L. 4. United Kingdom Private 22415 Lancashire Fusiliers 06/05/1916 Age: 18 III. D. 7. United Kingdom Serjeant 27816 Machine Gun Corps (Infantry) 30/06/1916 III. P. 9. United Kingdom Private 17921 Gloucestershire Regiment 30/06/1916 III. T. 4. United Kingdom Private 18/1432 Durham Light Infantry 27/07/1916 Age: 21 III. K. 14. United Kingdom Private 63 Highland Light Infantry 12/10/1915 Age: 22 II. C. 1. United Kingdom Private 14/22 East Yorkshire Regiment 06/08/1916 III. K. 16. United Kingdom Private 13661 North Staffordshire Regiment 17/01/1916 II. M. 5. United Kingdom Private SD/2268 Royal Sussex Regiment 30/06/1916 Age: 29 III. O. 5. United Kingdom Lance Corporal SD/1675 Royal Sussex Regiment 30/06/1916 Age: 25 III. Q. 9. United Kingdom Private 13/59 East Yorkshire Regiment 06/08/1916 Age: 21 III. L. 16. United Kingdom Private 17903 Welsh Regiment 16/02/1916 II. P. 10. United Kingdom Captain Royal Sussex Regiment 30/06/1916 Age: 37 III. B. 11. United Kingdom Private 13932 East Lancashire Regiment 12/03/1916 II. T. 4. United Kingdom Private 19994 Lancashire Fusiliers 08/05/1916 III. E. 4. United Kingdom Private 26275 West Yorkshire Regiment (Prince of Wales's Own) 15/09/1916 II. X. 4. United Kingdom Private 27832 Wiltshire Regiment 15/09/1918 V. C. 1. United Kingdom Private 19212 West Yorkshire Regiment (Prince of Wales's Own) 27/07/1916 III. D. 14. United Kingdom Corporal 18/456 Durham Light Infantry 27/07/1916 Age: 28 III. K. 15. United Kingdom Captain West Yorkshire Regiment (Prince of Wales's Own) 10/05/1916 Age: 24 III. F. 8. United Kingdom Private 5482 Royal Warwickshire Regiment 10/01/1916 II. L. 2. United Kingdom Private SD/2266 Royal Sussex Regiment 30/06/1916 III. O. 6. 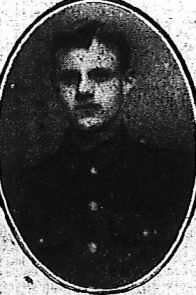 United Kingdom Lance Corporal 18/35 West Yorkshire Regiment (Prince of Wales's Own) 27/07/1916 Age: 19 III. G. 14. United Kingdom Private 12/1702 York and Lancaster Regiment 10/09/1916 II. Z. 1. United Kingdom Private 14393 Lancashire Fusiliers 26/05/1916 III. H. 6. United Kingdom Lieutenant West Yorkshire Regiment (Prince of Wales's Own) 27/07/1916 III. F. 14. United Kingdom Sapper 86727 Royal Engineers 09/11/1915 II. D. 11. United Kingdom Serjeant 16/904 West Yorkshire Regiment (Prince of Wales's Own) 27/07/1916 Age: 27 III. D. 15. United Kingdom Private 20692 Welsh Regiment 28/02/1916 Age: 17 II. R. 2. United Kingdom Private 18/471 Durham Light Infantry 27/07/1916 Age: 32 II. V. 12. United Kingdom Serjeant Major 33256 Royal Field Artillery 25/07/1916 III. Q. 13. United Kingdom Private SD/586 Royal Sussex Regiment 30/06/1916 III. G. 12. United Kingdom Private 10485 Highland Light Infantry 16/05/1915 I. C. 5. United Kingdom Private 23477 Worcestershire Regiment 03/09/1918 V. A. 5. United Kingdom Private 3102 Black Watch (Royal Highlanders) 20/05/1915 I. C. 6. United Kingdom Private 52506 Worcestershire Regiment 03/09/1918 Age: 19 V. A. 4. United Kingdom Lance Serjeant 15199 Welsh Regiment 04/12/1915 Age: 33 II. F. 3. United Kingdom Corporal 13/427 East Yorkshire Regiment 21/08/1916 III. R. 11. United Kingdom Private 27324 Royal Welsh Fusiliers 13/03/1916 II. T. 5. United Kingdom Corporal 19/79 Durham Light Infantry 13/05/1916 III. G. 1. United Kingdom Private 21322 Highland Light Infantry 14/10/1915 II. C. 4. United Kingdom Private 11205 Highland Light Infantry 16/05/1915 Age: 26 I. A. 9. United Kingdom Company Serjeant Major 6211 East Lancashire Regiment 25/02/1916 II. R. 1. United Kingdom Lance Corporal 61536 Royal Engineers 29/03/1917 Age: 36 IV. E. 8. United Kingdom Private 21575 Royal Scots 08/03/1916 II. S. 4. Indian Bearer 7438 Indian Army Medical Corps 27/05/1915 Indian. A. 8. United Kingdom Private 13330 Bedfordshire Regiment 28/07/1915 Age: 24 I. H. 5. United Kingdom Private 14/1535 York and Lancaster Regiment 16/08/1916 III. E. 18. United Kingdom Private 22128 Highland Light Infantry 25/04/1916 Age: 27 III. D. 1. United Kingdom Corporal 3353 Royal Berkshire Regiment 13/07/1916 III. P. 11. United Kingdom Serjeant 4032 The Loyal North Lancashire Regiment 16/04/1916 III. C. 3. United Kingdom Private 22058 Manchester Regiment 12/05/1916 III. F. 6. United Kingdom Private 27174 Royal Scots 08/03/1916 II. S. 2. United Kingdom Private SD/5193 Royal Sussex Regiment 30/06/1916 Age: 24 III. O. 10. United Kingdom Private SD/2667 Royal Sussex Regiment 30/06/1916 Age: 19 III. Q. 5. United Kingdom Private 81721 Durham Light Infantry 13/04/1918 Sp. Mem. 3. United Kingdom Private 13825 Gloucestershire Regiment 13/01/1916 Age: 22 II. L. 10. United Kingdom Private SD/3559 Royal Sussex Regiment 30/06/1916 Age: 23 III. D. 9. United Kingdom Corporal 10/990 East Yorkshire Regiment 22/09/1916 Age: 21 II. Z. 3. United Kingdom Private 17506 Welsh Regiment 09/02/1916 Age: 26 II. O. 12. United Kingdom Private 3398 London Regiment (Royal Fusiliers) 30/05/1915 I. E. 1. United Kingdom Rifleman 7876 London Regiment (Queen Victoria's Rifles) 26/11/1916 IV. A. 2. United Kingdom Serjeant 11786 Cheshire Regiment 14/04/1916 Age: 22 III. C. 2. 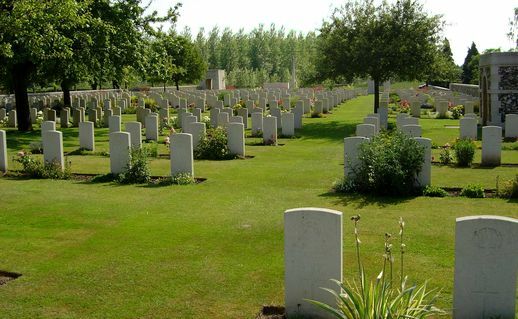 United Kingdom Private 4715 Connaught Rangers 27/09/1915 Age: 22 II. A. 4. United Kingdom Gunner 125126 Royal Field Artillery 25/05/1917 IV. H. 2. United Kingdom Rifleman 472657 London Regiment (The Rangers) 18/02/1917 IV. D. 3. United Kingdom Private 11722 King's Own (Royal Lancaster Regiment) 10/03/1916 Age: 34 II. R. 12. United Kingdom Lance Corporal 23629 Welsh Regiment 30/12/1915 II. J. 11. United Kingdom Private A/26148 Cheshire Regiment 18/03/1916 Age: 16 II. U. 4. United Kingdom Private 14269 King's Own (Royal Lancaster Regiment) 08/12/1915 Age: 22 II. F. 8. United Kingdom Serjeant 7925 Bedfordshire Regiment 31/07/1915 II. B. 7. United Kingdom Lieutenant Royal Welsh Fusiliers 12/02/1916 Age: 24 II. P. 5. United Kingdom Lance Corporal 14540 Lancashire Fusiliers 24/05/1916 III. H. 2. United Kingdom Private 21665 South Wales Borderers 07/02/1916 Age: 35 II. O. 10. 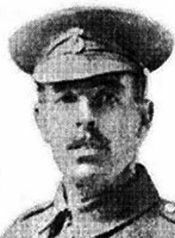 United Kingdom Captain Welsh Regiment 23/12/1915 Age: 42 II. J. 1. United Kingdom Private 4791 Worcestershire Regiment 10/10/1916 Age: 22 II. X. 6. United Kingdom Private S/5340 Seaforth Highlanders 09/05/1915 Age: 19 I. A. 5. United Kingdom Lance Corporal 18/267 Durham Light Infantry 27/07/1916 Age: 24 III. M. 14. United Kingdom Private 13981 South Lancashire Regiment 17/12/1915 II. H. 4. 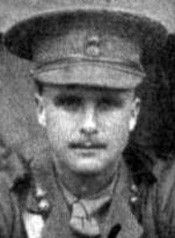 United Kingdom Lance Serjeant 22751 Machine Gun Corps (Infantry) 27/07/1916 Age: 21 III. J. 14. Indian Sepoy 3281 17th Indian Infantry (Loyal Regiment) 04/10/1915 Indian. D. 5. United Kingdom Lance Corporal 11637 King's Own (Royal Lancaster Regiment) 09/04/1916 III. B. 5. United Kingdom Private 1740 Welsh Regiment 07/03/1916 II. R. 11. United Kingdom Private 4218 King's Own (Royal Lancaster Regiment) 14/12/1915 II. G. 5. 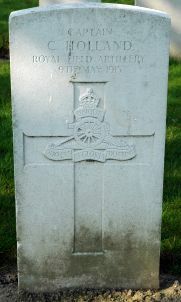 United Kingdom Gunner 11188 Royal Field Artillery 16/05/1915 Age: 21 I. D. 8. United Kingdom Private 17931 Welsh Regiment 25/12/1915 II. J. 3. United Kingdom Private 267020 Duke of Wellington's (West Riding Regiment) 10/04/1917 IV. G. 2. United Kingdom Private 13266 East Lancashire Regiment 31/12/1915 II. K. 1. United Kingdom Private 2913 Royal Sussex Regiment 30/06/1916 Age: 22 III. E. 10. United Kingdom Private 12/939 East Yorkshire Regiment 01/09/1916 II. W. 4. United Kingdom Private 5026 Royal Sussex Regiment 30/06/1916 III. P. 4. United Kingdom Rifleman C/3886 King's Royal Rifle Corps 20/07/1916 III. Q. 12. United Kingdom Private 22353 Royal Scots 09/03/1916 II. S. 6. United Kingdom Private S/8542 Black Watch (Royal Highlanders) 26/10/1915 II. D. 2. United Kingdom Private 1496 London Regiment (Royal Fusiliers) 09/05/1915 I. A. 4. United Kingdom Private 926 Royal Sussex Regiment 30/06/1916 III. R. 7. United Kingdom Private 9466 South Staffordshire Regiment 21/07/1915 I. J. 4. United Kingdom Private 18273 Royal Scots Fusiliers 29/07/1915 II. B. 10. United Kingdom Lieutenant Royal Berkshire Regiment 13/07/1916 Age: 19 III. O. 11. United Kingdom Private S/5117 Hampshire Regiment 22/06/1916 III. N. 1. United Kingdom Serjeant SD/2677 Royal Sussex Regiment 30/06/1916 Age: 24 III. T. 8. United Kingdom Private 12/2032 York and Lancaster Regiment 10/09/1916 Age: 33 II. Y. 3. United Kingdom Lance Corporal 11723 Leicestershire Regiment 11/05/1915 I. A. 3. United Kingdom Private 1330 Royal Sussex Regiment 30/06/1916 Age: 23 III. P. 8. 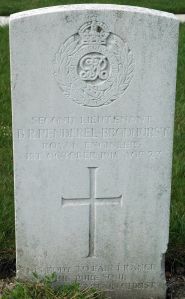 United Kingdom Private 18/488 Durham Light Infantry 27/07/1916 Age: 21 III. M. 15. United Kingdom Lance Corporal 58 Royal Sussex Regiment 30/06/1916 Age: 22 III. P. 1. United Kingdom Captain Royal Field Artillery 29/05/1915 Age: 25 I. D. 6. United Kingdom Corporal 19371 Gloucestershire Regiment 30/06/1916 Age: 33 III. H. 10. United Kingdom Private 3113 Royal Sussex Regiment 30/06/1916 Age: 28 III. F. 10. United Kingdom Lance Corporal 1350 Sherwood Foresters (Notts and Derby Regiment) 04/11/1915 Age: 21 II. D. 4. United Kingdom Private 10/505 East Yorkshire Regiment 16/09/1916 Age: 24 III. O. 18. United Kingdom Private 31860 Sherwood Foresters (Notts and Derby Regiment) 30/05/1916 III. J. 7. United Kingdom Corporal 2248 Black Watch (Royal Highlanders) 12/07/1915 I. G. 10. United Kingdom Private 3617 London Regiment (Royal Fusiliers) 13/10/1915 Age: 21 II. C. 3. United Kingdom Private 15073 King's Own (Royal Lancaster Regiment) 29/12/1915 Age: 23 II. J. 8. United Kingdom Second Lieutenant Royal Engineers 01/06/1915 Age: 26 I. E. 8. United Kingdom Private 3534 London Regiment (Royal Fusiliers) 13/09/1915 II. B. I. United Kingdom Private 17753 Welsh Regiment 27/01/1916 II. H. 9. United Kingdom Driver 709 Royal Field Artillery 22/03/1916 Age: 24 II. U. 11. United Kingdom Private 20137 King's Own (Royal Lancaster Regiment) 14/12/1915 II. G. 4. United Kingdom Second Lieutenant West Yorkshire Regiment (Prince of Wales's Own) 14/09/1916 Age: 18 II. X. 2. United Kingdom Private 23562 Sherwood Foresters (Notts and Derby Regiment) 30/05/1916 III. K. 8. United Kingdom Private 21910 York and Lancaster Regiment 06/09/1916 II. Y. 1. United Kingdom Lance Corporal 16587 South Staffordshire Regiment 20/07/1915 I. J. 1. United Kingdom Lance Corporal 3354 Worcestershire Regiment 10/10/1916 Age: 37 II. ZI. 4. United Kingdom Lance Serjeant 14456 East Lancashire Regiment 17/02/1916 Age: 29 II. Q. 1. Indian Captain 9th Gurkha Rifles 26/06/1915 Age: 29 I. G. 7. United Kingdom Serjeant 18/496 Durham Light Infantry 27/07/1916 Age: 24 III. L. 14. United Kingdom Private 25193 The King's (Liverpool Regiment) 02/01/1916 II. K. 3. United Kingdom Private 18/280 Durham Light Infantry 27/07/1916 Age: 23 III. L. 15. United Kingdom Rifleman 4083 London Regiment (London Rifle Brigade) 14/11/1916 II. V. 4. United Kingdom Private 3575 Royal Sussex Regiment 30/06/1916 III. Q. 6. United Kingdom Gunner 51813 Royal Field Artillery 25/05/1915 I. C. 9. United Kingdom Lance Corporal 15810 Worcestershire Regiment 20/12/1915 Age: 24 II. H. 8. United Kingdom Private 19559 Duke of Cornwall's Light Infantry 17/12/1916 Age: 22 IV. A. 7. United Kingdom Private G/51414 Royal Fusiliers 01/02/1917 IV. B. 5. United Kingdom Private 63926 Royal Army Medical Corps 30/05/1916 Age: 23 III. K. 1. Indian Captain 3rd Queen Alexandra's Own Gurkha Rifles 16/05/1915 Age: 35 I. C. 2. United Kingdom Private 25732 Royal Welsh Fusiliers 19/01/1916 Age: 35 II. M. 8. United Kingdom Private 19906 Gloucestershire Regiment 30/06/1916 Age: 44 III. T. 3. Indian Sepoy 2521 89th Punjabis 25/09/1915 Indian. B. 5. United Kingdom Private 23758 Sherwood Foresters (Notts and Derby Regiment) 24/05/1916 III. H. 3. United Kingdom Private 12781 Cheshire Regiment 02/01/1916 II. K. 2. United Kingdom Private 12677 North Staffordshire Regiment 17/01/1916 Age: 21 II. M. 7. United Kingdom Private 26832 East Lancashire Regiment 11/08/1916 Age: 31 III. O. 17. United Kingdom Private 14502 The King's (Liverpool Regiment) 03/01/1916 Age: 20 II. K. 8. United Kingdom Private 9271 The Queen's (Royal West Surrey Regiment) 22/07/1915 Age: 26 I. J. 5. United Kingdom Corporal S/4343 Rifle Brigade 21/01/1917 IV. B. 7. United Kingdom Private 9047 The King's (Liverpool Regiment) 29/11/1915 II. E. 12. United Kingdom Private 54358 Royal Welsh Fusiliers 12/09/1918 Age: 27 V. E. 2. United Kingdom Lieutenant York and Lancaster Regiment 01/09/1916 II. W. 2. United Kingdom Private 4885 Royal Sussex Regiment 30/06/1916 III. B. 10. United Kingdom Corporal 3/5045 Hampshire Regiment 30/06/1916 Age: 31 III. N. 8. United Kingdom Private 26626 East Lancashire Regiment 17/08/1916 III. F. 18. United Kingdom Lance Corporal 4215 Royal Sussex Regiment 21/06/1916 III. M. 4. United Kingdom Private 18/521 Durham Light Infantry 27/07/1916 Age: 36 III. G. 15. United Kingdom Private 14877 North Staffordshire Regiment 10/01/1916 Age: 18 II. L. 4. United Kingdom Lance Serjeant 21640 South Wales Borderers 09/02/1916 Age: 22 II. P. 1. United Kingdom Private 19275 Royal Welsh Fusiliers 30/01/1916 Age: 21 II. O. 2. United Kingdom Private 12674 The Loyal North Lancashire Regiment 01/03/1916 II. R. 7. United Kingdom Private 22122 East Yorkshire Regiment 30/07/1916 III. D. 16. United Kingdom Private 12875 The Loyal North Lancashire Regiment 24/02/1916 II. Q. 9. United Kingdom Private 26979 East Lancashire Regiment 09/09/1916 II. Y. 2. United Kingdom Private 7221 Royal Warwickshire Regiment 20/01/1916 II. M. 10. United Kingdom Corporal 15783 East Lancashire Regiment 06/08/1916 Age: 24 III. B. 17. United Kingdom Private 1211012 East Yorkshire Regiment 05/08/1916 III. N. 15. United Kingdom Gunner 63980 Royal Field Artillery 15/03/1916 Age: 22 II. T. 7. United Kingdom Sapper 87070 Royal Engineers 22/05/1916 Age: 20 III. H. 1. United Kingdom Private 525 Royal Sussex Regiment 21/07/1916 Age: 36 III. C. 13. United Kingdom Private 12655 North Staffordshire Regiment 17/01/1916 II. M. 4. United Kingdom Private 15018 Hampshire Regiment 23/07/1916 Age: 32 III. F. 13. United Kingdom Private 2701 Royal Sussex Regiment 30/06/1916 III. S. 8. United Kingdom Private 17605 South Lancashire Regiment 07/03/1916 II. S. 1. United Kingdom Private 235269 Royal Warwickshire Regiment 06/09/1918 Age: 24 V. B. 1. United Kingdom Private 12613 King's Own (Royal Lancaster Regiment) 23/02/1916 Age: 20 II. Q. 7. United Kingdom Private 2179 Manchester Regiment 10/08/1915 II. B. 4. United Kingdom Private 428 Royal Sussex Regiment 30/06/1916 III. R. 2. United Kingdom Private 4383 Worcestershire Regiment 03/06/1916 III. L. 2. United Kingdom Private 307994 Duke of Wellington's (West Riding Regiment) 03/05/1917 Age: 23 IV. G. 4. United Kingdom Lance Corporal 17447 Gloucestershire Regiment 13/01/1916 II. L. 12. United Kingdom Private 34608 Royal Warwickshire Regiment 08/09/1918 V. E. 1. United Kingdom Private 15938 The Loyal North Lancashire Regiment 01/03/1916 Age: 25 II. R. 6. United Kingdom Private SD/1051 Royal Sussex Regiment 29/06/1916 Age: 21 III. O. 21. United Kingdom Private 14036 North Staffordshire Regiment 11/01/1916 II. L. 8. United Kingdom Private 9465 South Staffordshire Regiment 03/12/1915 II. F. 5. United Kingdom Serjeant 14/781 York and Lancaster Regiment 01/09/1916 Age: 34 II. W. 3. United Kingdom Captain Royal Field Artillery 09/05/1915 I. A. 1. United Kingdom Private 8029 Leicestershire Regiment 22/05/1915 I. D. 3. United Kingdom Private 21929 Welsh Regiment 22/01/1916 II. N. 11. United Kingdom Private 20128 South Wales Borderers 06/02/1916 II. O. 7. United Kingdom Private 12623 East Lancashire Regiment 12/12/1915 Age: 23 II. F. 10. United Kingdom Private 13984 Hampshire Regiment 23/07/1916 III. J. 13. United Kingdom Private 2707 Royal Sussex Regiment 30/06/1916 Age: 36 III. Q. 4. United Kingdom Private 28140 Royal Welsh Fusiliers 08/01/1916 II. K. 10. United Kingdom Gunner 173 Machine Gun Corps (Motors) 07/11/1915 Age: 20 II. D. 8. United Kingdom Lance Corporal 5868 Leicestershire Regiment 10/06/1915 I. E. 2. United Kingdom Private 2208 Worcestershire Regiment 21/10/1916 Age: 20 II. V. 1. United Kingdom Serjeant 16588 Royal Welsh Fusiliers 03/04/1916 Age: 35 III. B. 1. United Kingdom Private 24090 Machine Gun Corps (Infantry) 11/02/1917 Age: 21 IV. D. 1. United Kingdom Private 58150 Welsh Regiment 20/09/1918 Sp. Mem. 2. United Kingdom Private 1653 Royal Sussex Regiment 30/06/1916 III. O. 8. United Kingdom Private 29284 Welsh Regiment 22/02/1916 II. Q. 5. United Kingdom Private 18483 South Lancashire Regiment 06/04/1916 III. B. 3. United Kingdom Private 19872 Royal Welsh Fusiliers 10/01/1916 II. L. 9. United Kingdom Private 20833 South Wales Borderers 06/02/1916 II. O. 8. United Kingdom Second Lieutenant West Yorkshire Regiment (Prince of Wales's Own) 27/07/1916 Age: 20 III. F. 15. United Kingdom Private 20657 Wiltshire Regiment 20/03/1916 II. U. 3. United Kingdom Lieutenant London Regiment (Royal Fusiliers) 27/06/1915 I. G. 8. United Kingdom Second Lieutenant Royal Field Artillery 30/06/1916 Age: 25 III. H. 9. United Kingdom Private S/8000 Black Watch (Royal Highlanders) 29/10/1915 Age: 22 II. C. 9. United Kingdom Serjeant 7044 Wiltshire Regiment 24/07/1915 Age: 27 I. G. 3. United Kingdom Rifleman 10823 London Regiment (London Rifle Brigade) 24/11/1916 Age: 34 II. V. 5. United Kingdom Lance Corporal 22744 Machine Gun Corps (Infantry) 27/07/1916 III. P. 14. United Kingdom Corporal 1259 Black Watch (Royal Highlanders) 13/07/1915 Age: 37 I. H. 8. Indian Havildar 1629 58th Vaughan's Rifles (Frontier Force) 09/05/1915 Indian. A. 4. United Kingdom Private 20973 Royal Warwickshire Regiment 06/09/1918 V. B. 1. United Kingdom Private 3195 Worcestershire Regiment 20/10/1916 Age: 26 II. V. 2. United Kingdom Private 3147 Royal Sussex Regiment 30/06/1916 Age: 29 III. Q. 3. United Kingdom Corporal 13171 King's Own (Royal Lancaster Regiment) 11/12/1915 II. F. 9. United Kingdom Private 1077 Royal Sussex Regiment 23/07/1916 Age: 21 III. P. 13. United Kingdom Private 1973 London Regiment (Royal Fusiliers) 20/09/1915 Age: 17 II. A. 1. Indian Jemadar 89th Punjabis 26/09/1915 Indian. C. 5. Indian Sepoy 3262 17th Indian Infantry (Loyal Regiment) 05/10/1915 Indian. D. 6. United Kingdom Private 2344 London Regiment (Royal Fusiliers) 12/10/1915 II. C. 2. United Kingdom Private 1230 Royal Sussex Regiment 30/06/1916 III. O. 4. United Kingdom Private 12095 The Loyal North Lancashire Regiment 21/02/1916 II. Q. 4. 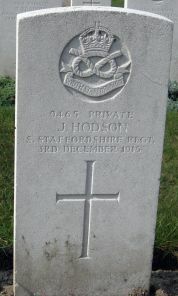 United Kingdom Private 15050 Hampshire Regiment 30/06/1916 Age: 28 III. J. 10. United Kingdom Private SD/1845 Royal Sussex Regiment 30/06/1916 III. O. 3. United Kingdom Private 4301 Sherwood Foresters (Notts and Derby Regiment) 25/11/1915 II. E. 10. Indian Rifleman 2722 1st King George's Own Gurkha Rifles (The Malaun Regiment) 22/05/1915 Indian B. 1. United Kingdom Private 19354 Gloucestershire Regiment 30/06/1916 III. T. 2. United Kingdom Second Lieutenant Welsh Regiment 20/09/1918 Sp. Mem. 1. United Kingdom Private 266074 Duke of Wellington's (West Riding Regiment) 10/04/1917 IV. G. 3. United Kingdom Private 4029 Royal Sussex Regiment 30/06/1916 Age: 19 III. S. 6. United Kingdom Private 22547 Royal Welsh Fusiliers 28/01/1916 Age: 31 II. N. 6. United Kingdom Lance Corporal 10/797 East Yorkshire Regiment 03/08/1916 III. J. 16. Indian Rifleman 2179 1st King George's Own Gurkha Rifles (The Malaun Regiment) 27/08/1915 Indian D. 3. United Kingdom Private 24782 Machine Gun Corps (Infantry) 29/03/1917 Age: 25 IV. F. 2. United Kingdom Private 14588 Welsh Regiment 30/12/1915 II. J. 10. United Kingdom Corporal 18060 Welsh Regiment 31/01/1916 II. O. 3. United Kingdom Private 23135 South Wales Borderers 03/02/1916 II. O. 4. United Kingdom Private 19927 Welsh Regiment 09/02/1916 Age: 17 II. P. 3. United Kingdom Rifleman R/33766 King's Royal Rifle Corps 28/12/1916 Age: 30 IV. B. 4. United Kingdom Private 19589 Welsh Regiment 16/03/1916 Age: 21 II. T. 8. United Kingdom Lance Corporal 19138 Royal Welsh Fusiliers 10/01/1916 Age: 25 II. L. 6. United Kingdom Private 16600 Cheshire Regiment 25/12/1915 II. J. 5. United Kingdom Serjeant 18/940 Durham Light Infantry 27/07/1916 Age: 30 III. O. 15. United Kingdom Private 28742 Cheshire Regiment 20/03/1916 II. U. 9. United Kingdom Private 21505 Royal Welsh Fusiliers 29/01/1916 Age: 24 II. N. 12. United Kingdom Private 24117 Gloucestershire Regiment 27/05/1916 Age: 30 III. J. 1. United Kingdom Serjeant 20500 South Wales Borderers 05/02/1916 Age: 39 II. O. 6. United Kingdom Private 15/1612 West Yorkshire Regiment (Prince of Wales's Own) 02/08/1916 III. F. 16. Indian Sepoy 4205 58th Vaughan's Rifles (Frontier Force) 03/11/1915 Indian. D. 9. United Kingdom Private 10/160 East Yorkshire Regiment 18/09/1916 Age: 24 III. P. 18. United Kingdom Private 18716 Worcestershire Regiment 20/12/1915 Age: 26 II. H. 7. United Kingdom Serjeant 882 London Regiment (Royal Fusiliers) 23/06/1915 I. F. 2. United Kingdom Private 21984 Royal Scots 11/03/1916 II. T. 1. United Kingdom Private 9702 Black Watch (Royal Highlanders) 04/07/1915 Age: 31 I. G. 9. United Kingdom Private 23109 Royal Welsh Fusiliers 17/03/1916 Age: 23 II. T. 11. United Kingdom Private 10167 Connaught Rangers 02/10/1915 Age: 20 II. A. 6. United Kingdom Private 32020 Bedfordshire Regiment 03/12/1916 IV. A. 3. United Kingdom Serjeant 17480 Welsh Regiment 14/02/1916 II. P. 6. United Kingdom Private 11468 The King's (Liverpool Regiment) 21/12/1915 Age: 29 II. H. 5. United Kingdom Private 2121 Sherwood Foresters (Notts and Derby Regiment) 21/11/1915 Age: 17 II. E. 5. United Kingdom Private 3/5155 Hampshire Regiment 25/06/1916 Age: 24 III. M. 8. Indian Sepoy 3460 58th Vaughan's Rifles (Frontier Force) 09/05/1915 Indian. A. 5. Indian Rifleman 2852 1st King George's Own Gurkha Rifles (The Malaun Regiment) 13/10/1915 Indian C. 7. Indian Rifleman 2732 1st King George's Own Gurkha Rifles (The Malaun Regiment) 21/08/1915 Indian B. 3. United Kingdom Serjeant 493664 London Regiment 17/02/1917 IV. D. 7. United Kingdom Lance Corporal 315132 Hampshire Regiment 22/06/1916 Age: 41 III. N. 4. United Kingdom Private 17428 East Lancashire Regiment 09/03/1916 II. S. 7. United Kingdom Private 14186 Wiltshire Regiment 18/03/1916 Age: 28 II. U. 2. United Kingdom Private 18560 Cheshire Regiment 03/03/1916 Age: 20 II. R. 4. Indian Rifleman 2825 39th Garhwal Rifles 11/05/1915 Indian. A. 2. United Kingdom Private 14/699 York and Lancaster Regiment 01/09/1916 II. W. 1. United Kingdom Private 19/1075 Durham Light Infantry 11/05/1916 III. F. 5. United Kingdom Private 705 Royal Sussex Regiment 30/06/1916 Age: 21 III. R. 1. United Kingdom Second Lieutenant South Wales Borderers 09/05/1915 II. B. 2. United Kingdom Private 4293 The Queen's (Royal West Surrey Regiment) 19/07/1915 I. J. 9. United Kingdom Private 16500 Welsh Regiment 08/01/1916 II. K. 12. United Kingdom Private 11079 Highland Light Infantry 05/10/1915 II. A. 8. United Kingdom Private 13/584 York and Lancaster Regiment 11/08/1916 Age: 21 III. J. 17. United Kingdom Private 23493 Sherwood Foresters (Notts and Derby Regiment) 30/05/1916 III. J. 5. United Kingdom Private 4222 Royal Sussex Regiment 30/06/1916 III. F. 9. United Kingdom Private 15046 South Lancashire Regiment 09/04/1916 Age: 19 III. B. 6. United Kingdom Private 282962 London Regiment (Royal Fusiliers) 10/02/1917 IV. C. 7. United Kingdom Private 15809 South Lancashire Regiment 11/03/1916 Age: 19 II. S. 12. United Kingdom Private 12/1058 East Yorkshire Regiment 06/08/1916 III. P. 16. United Kingdom Private 17143 Welsh Regiment 18/02/1916 II. Q. 2. United Kingdom Private 5233 Highland Light Infantry 17/04/1916 III. C. 5. United Kingdom Private 17/1611 West Yorkshire Regiment (Prince of Wales's Own) 09/05/1916 III. F. 4. United Kingdom Private 31711 Royal Welsh Fusiliers 04/03/1916 II. R. 10. United Kingdom Acting Bombardier 57314 Royal Field Artillery 16/05/1915 Age: 29 I. B. 8. United Kingdom Private 17935 Gloucestershire Regiment 30/06/1916 III. G. 11. United Kingdom Private 23489 Sherwood Foresters (Notts and Derby Regiment) 30/05/1916 III. J. 6. United Kingdom Private 10/136 East Yorkshire Regiment 11/08/1916 III. P. 17. United Kingdom Private 17/1644 West Yorkshire Regiment (Prince of Wales's Own) 16/05/1916 III. G. 3. United Kingdom Private 307666 Duke of Wellington's (West Riding Regiment) 07/04/1917 IV. F. 7. United Kingdom Serjeant 13840 Gloucestershire Regiment 21/01/1916 Age: 25 II. M. 11. United Kingdom Private 8365 Wiltshire Regiment 24/07/1915 I. G. 2. United Kingdom Private 26401 Lancashire Fusiliers 25/05/1916 III. H. 7. United Kingdom Gunner 75095 Royal Field Artillery 16/05/1915 I. D. 7. United Kingdom Private 17756 Welsh Regiment 27/01/1916 Age: 32 II. N. 10. United Kingdom Lance Corporal 22195 Manchester Regiment 08/05/1916 III. F. 3. United Kingdom Private 10643 Highland Light Infantry 13/10/1915 Age: 27 II. C. 5. United Kingdom Private 3/7288 Seaforth Highlanders 31/05/1915 Age: 18 I. D. 9. United Kingdom Private 3955 Royal Berkshire Regiment 13/07/1916 III. Q. 11. Indian Rifleman 2661 9th Gurkha Rifles 22/10/1915 Indian C. 8. Indian Rifleman 5220 9th Gurkha Rifles 09/05/1915 Indian A. 5. Indian Bearer 7162 Army Bearer Corps 09/05/1915 Indian. A. 6. Indian Lieutenant 39th Garhwal Rifles 14/05/1915 Age: 27 I. B. 5. United Kingdom Private 1472 Worcestershire Regiment 24/08/1916 Age: 21 III. J. 18. United Kingdom Private 267881 Duke of Wellington's (West Riding Regiment) 13/05/1917 IV. G. 7. United Kingdom Private 2102 Sherwood Foresters (Notts and Derby Regiment) 19/11/1915 II. E. 2. United Kingdom Private 18/557 Durham Light Infantry 01/08/1916 Age: 40 III. H. 15. United Kingdom Private 5279 Royal Berkshire Regiment 12/07/1916 III. K. 12. United Kingdom Private 12/986 York and Lancaster Regiment 08/08/1916 III. H. 16. United Kingdom Private 3198 Royal Berkshire Regiment 13/07/1916 III. M. 11. United Kingdom Private 201227 Duke of Wellington's (West Riding Regiment) 12/06/1917 IV. H. 4. United Kingdom Private 4626 Highland Light Infantry 12/03/1916 II. T. 3. United Kingdom Private 2951 Black Watch (Royal Highlanders) 12/07/1915 I. H. 6. United Kingdom Private 11722 The King's (Liverpool Regiment) 26/12/1915 Age: 37 II. J. 7. United Kingdom Private 17667 The Loyal North Lancashire Regiment 24/02/1916 II. Q. 8. United Kingdom Private 20846 Gloucestershire Regiment 30/05/1916 Age: 20 III. K. 2. United Kingdom Private 3427 Sherwood Foresters (Notts and Derby Regiment) 15/11/1915 Age: 21 II. E. 1. United Kingdom Second Lieutenant Suffolk Regiment 21/06/1915 Age: 27 I. F. 7. United Kingdom Gunner 83313 Royal Field Artillery 20/03/1916 II. U. 8. United Kingdom Private 1609 Royal Sussex Regiment 30/06/1916 III. C. 11. United Kingdom Private 9870 Leicestershire Regiment 09/05/1915 Age: 19 I. A. 6. United Kingdom Lance Serjeant 769 Royal Sussex Regiment 30/06/1916 Age: 20 III. R. 3. Indian Sepoy 3627 124th Duchess of Connaught's Own Baluchistan Infantry 18/09/1915 Indian. C. 4. United Kingdom Corporal 14840 Lancashire Fusiliers 15/06/1916 Age: 34 III. M. 1. United Kingdom Private 4191 Worcestershire Regiment 10/10/1916 II. ZI. 6. United Kingdom Private 18505 East Lancashire Regiment 01/01/1916 Age: 17 II. J. 12. United Kingdom Private 9537 Black Watch (Royal Highlanders) 05/11/1915 II. D. 7. United Kingdom Private 18/558 Durham Light Infantry 27/07/1916 Age: 30 II. V. 11. United Kingdom Lance Corporal 16/357 West Yorkshire Regiment (Prince of Wales's Own) 27/07/1916 III. B. 15. United Kingdom Private 514312 London Regiment (London Scottish) 02/03/1917 IV. E. 2. United Kingdom Private 10420 Royal Welsh Fusiliers 15/09/1918 Age: 27 V. D. 1. United Kingdom Lance Corporal 952 Black Watch (Royal Highlanders) 14/07/1915 I. F. 10. United Kingdom Lance Corporal 18/548 Durham Light Infantry 27/07/1916 III. N. 13. United Kingdom Lance Corporal 19953 Lancashire Fusiliers 08/05/1916 III. E. 1. United Kingdom Second Lieutenant Welsh Regiment 23/01/1916 Age: 20 II. N. 1. United Kingdom Private 4693 Highland Light Infantry 28/04/1916 III. D. 4. United Kingdom Private 12/1097 East Yorkshire Regiment 06/08/1916 III. O. 16. United Kingdom Private 8091 Highland Light Infantry 05/11/1915 II. D. 6. United Kingdom Private 22216 Royal Scots 10/03/1916 Age: 18 II. S. 9. United Kingdom Private 25608 Royal Scots 21/04/1916 Age: 18 III. C. 7. United Kingdom Private 3809 Royal Berkshire Regiment 13/07/1916 III. L. 12. United Kingdom Private 5645 Highland Light Infantry 02/03/1916 II. R. 3. United Kingdom Private 5192 Highland Light Infantry 26/04/1916 Age: 20 III. D. 2. United Kingdom Private 4810 Royal Sussex Regiment 30/06/1916 Age: 18 III. A. 10. United Kingdom Company Quartermaster Serjeant 3/256 Wiltshire Regiment 25/12/1915 Age: 44 II. J. A. United Kingdom Lance Corporal 18/543 Durham Light Infantry 27/07/1916 III. P. 15. United Kingdom Private 444 Royal Sussex Regiment 30/06/1916 III. R. 6. United Kingdom Private 4048 Royal Sussex Regiment 30/06/1916 Age: 20 III. Q. 8. United Kingdom Private 2243 Royal Sussex Regiment 30/06/1916 III. P. 3. United Kingdom Private 12972 Hampshire Regiment 30/06/1916 III. K. 10. United Kingdom Private SD/2272 Royal Sussex Regiment 01/07/1916 Age: 22 III. N. 7. United Kingdom Private 28604 Manchester Regiment 08/05/1916 III. E. 6. United Kingdom Rifleman 472662 London Regiment (The Rangers) 09/02/1917 IV. C. 5. United Kingdom Private 25926 Royal Scots 08/03/1916 Age: 17 II. S. 3. United Kingdom Private 1070 London Regiment (Royal Fusiliers) 16/05/1915 I. B. 6. United Kingdom Private 10043 Wiltshire Regiment 28/07/1915 I. H. 4. United Kingdom Gunner 5409 Royal Field Artillery 17/03/1916 II. T. 9. United Kingdom Second Lieutenant Durham Light Infantry 27/07/1916 Age: 19 III. O. 14. United Kingdom Private 16/892 West Yorkshire Regiment (Prince of Wales's Own) 27/07/1916 III. C. 15. United Kingdom Corporal 21544 Welsh Regiment 23/01/1916 II. N. 2. United Kingdom Serjeant 1598 Sherwood Foresters (Notts and Derby Regiment) 25/11/1915 Age: 22 II. E. 9. United Kingdom Private 15258 Leicestershire Regiment 21/05/1915 I. D. 2. United Kingdom Lance Corporal 3403 Royal Sussex Regiment 30/06/1916 III. S. 7. United Kingdom Private 9852 Bedfordshire Regiment 31/07/1915 II. B. 8. Indian Sepoy 2480 89th Punjabis 03/10/1915 Indian. D. 4. United Kingdom Serjeant 384 Black Watch (Royal Highlanders) 15/05/1915 Age: 27 I. C. 1. United Kingdom Private 14510 East Lancashire Regiment 18/12/1915 II. H. 2. United Kingdom Second Lieutenant The Queen's (Royal West Surrey Regiment) 19/07/1915 I. J. 8. United Kingdom Gunner 66625 Royal Field Artillery 16/05/1915 I. B. 7. United Kingdom Private 14150 Lancashire Fusiliers 08/06/1916 Age: 21 III. L. 6. Indian Bearer 7349 Indian Army Medical Corps 09/05/1915 Indian. A. 7. Indian Havildar 4069 4th Gurkha Rifles 22/05/1915 Indian B. 2. United Kingdom Private 3788 Royal Berkshire Regiment 14/07/1916 Age: 23 III. M. 12. United Kingdom Private 12262 The Loyal North Lancashire Regiment 17/12/1915 Age: 23 II. G. 9. United Kingdom Lance Corporal 216 Royal Sussex Regiment 25/06/1916 III. M. 7. United Kingdom Private 2253 Black Watch (Royal Highlanders) 13/07/1915 Age: 21 I. H. 7. United Kingdom Private 18132 King's Own (Royal Lancaster Regiment) 10/03/1916 Age: 34 II. S. 5. United Kingdom Serjeant 21505 Lancashire Fusiliers 05/05/1916 Age: 38 III. D. 6. United Kingdom Private 25269 Sherwood Foresters (Notts and Derby Regiment) 30/05/1916 Age: 23 III. J. 3. United Kingdom Private 1745 London Regiment (Royal Fusiliers) 11/11/1915 II. D. 12. United Kingdom Private 2705 Sherwood Foresters (Notts and Derby Regiment) 08/11/1915 Age: 24 II. D. 10. Indian Second Lieutenant Queen Victoria's Own Corps of Guides Cavalry (F.F.) (Lumsden's) 16/05/1915 I. C. 3. United Kingdom Gunner L/17815 Royal Field Artillery 28/07/1916 II. V. 8. United Kingdom Private 5218 Highland Light Infantry 12/03/1916 II. T. 2. United Kingdom Private 22145 Manchester Regiment 08/05/1916 III. F. 2. United Kingdom Rifleman R/6323 King's Royal Rifle Corps 28/12/1916 IV. B. 6. United Kingdom Private 15126 Hampshire Regiment 23/07/1916 Age: 34 III. G. 13. United Kingdom Private 154079 Machine Gun Corps (Infantry) 20/09/1918 Age: 19 V. D. 2. United Kingdom Second Lieutenant Royal Field Artillery 17/06/1916 Age: 20 III. M. 2. United Kingdom Private 2486 Manchester Regiment 10/08/1915 II. B. 3. United Kingdom Private 10468 Royal Welsh Fusiliers 18/07/1915 Age: 21 I. J. 6. Indian Rifleman 2486 39th Garhwal Rifles 18/03/1915 Indian. A. 9. United Kingdom Private 17741 Welsh Regiment 27/01/1916 II. N. 5. United Kingdom Private 12/1522 East Yorkshire Regiment 06/08/1916 Age: 28 III. D. 17. Indian Rifleman 2791 5th Gurkha Rifles (Frontier Force) 18/10/1915 Indian D. 7. United Kingdom Lance Corporal 4233 Royal Sussex Regiment 30/06/1916 Age: 28 III. F. 11. United Kingdom Private 22193 Royal Welsh Fusiliers 11/01/1916 II. L. 7. United Kingdom Private 55720 Machine Gun Corps (Infantry) 02/07/1917 IV. J. 1. United Kingdom Private 4065 Royal Sussex Regiment 30/06/1916 III. O. 9. United Kingdom Private 21384 Royal Scots 10/03/1916 Age: 20 II. S. 10. United Kingdom Private 10/543 East Yorkshire Regiment 01/08/1916 Age: 22 III. E. 16. United Kingdom Private 3/370 Wiltshire Regiment 29/07/1915 II. B. 9. United Kingdom Second Lieutenant Royal Engineers 01/10/1918 Age: 27 V. C. 2. United Kingdom Corporal 2638 Oxford and Bucks Light Infantry 09/07/1916 III. N. 10. United Kingdom Private 16866 Welsh Regiment 04/12/1915 II. F. 7. United Kingdom Private 3189 Royal Sussex Regiment 30/06/1916 Age: 29 III. S. 3. United Kingdom Private 17717 Welsh Regiment 10/02/1916 II. P. 4. United Kingdom Private 3/2541 Black Watch (Royal Highlanders) 09/05/1915 I. E. 7. United Kingdom Private S/7140 Black Watch (Royal Highlanders) 10/07/1915 I. A. 10. United Kingdom Private 12/1978 York and Lancaster Regiment 29/08/1916 III. N. 7. United Kingdom Rifleman R/17658 King's Royal Rifle Corps 19/07/1916 III. B. 13. United Kingdom Lance Corporal 17875 East Lancashire Regiment 05/08/1916 III. Q. 15. United Kingdom Private 266122 Duke of Wellington's (West Riding Regiment) 29/03/1917 IV. F. 5. United Kingdom Rifleman 472677 London Regiment (The Rangers) 18/02/1917 IV. D. 4. Indian Rifleman 5155 9th Gurkha Rifles 24/10/1915 Indian D. 8. United Kingdom Private 9613 Connaught Rangers 27/09/1915 II. A. 3. United Kingdom Private 22573 Lancashire Fusiliers 18/03/1916 Age: 19 II. T. 12. United Kingdom Private 51297 Worcestershire Regiment 03/09/1918 V. A. 3. United Kingdom Private 3019 Worcestershire Regiment 04/06/1916 III. L. 5. United Kingdom Private 24081 Gloucestershire Regiment 30/05/1916 III. K. 5. United Kingdom Private 265913 Duke of Wellington's (West Riding Regiment) 29/03/1917 Age: 20 IV. F. 4. United Kingdom Private 2212 Royal Sussex Regiment 30/06/1916 Age: 19 III. O. 7. United Kingdom Private 15514 Hampshire Regiment 22/06/1916 III. N. 2. United Kingdom Private 18416 Gloucestershire Regiment 30/06/1916 III. R. 8. United Kingdom Corporal 73578 Machine Gun Corps (Infantry) 29/03/1917 Age: 22 IV. F. 1. Indian Lance Naik 2569 1st King George's Own Gurkha Rifles (The Malaun Regiment) 21/11/1915 Indian B. 8. Indian Naik 1141 6th Jat Light Infantry 01/06/1915 Indian. C. 1. United Kingdom Driver TS/932 Army Service Corps 16/06/1915 I. F. 6. Indian Lance Naik 3117 Burma Military Police 13/10/1915 Indian. D. 7. United Kingdom Rifleman 11081 London Regiment (London Rifle Brigade) 26/11/1916 II. V. 6. United Kingdom Private 24076 Gloucestershire Regiment 02/06/1916 Age: 18 III. L. 1. United Kingdom Private 18560/A Welsh Regiment 28/12/1915 Age: 34 II. J. 9. United Kingdom Private 20874 Gloucestershire Regiment 30/05/1916 Age: 19 III. K. 3. United Kingdom Private 8885 The King's (Liverpool Regiment) 23/11/1915 Age: 21 II. E. 7. United Kingdom Lance Serjeant 14/599 York and Lancaster Regiment 28/08/1916 III. R. 12. United Kingdom Private 19/1416 Durham Light Infantry 19/05/1916 III. G. 8. United Kingdom Private 31782 Duke of Cornwall's Light Infantry 17/12/1916 Age: 37 IV. A. 6. United Kingdom Private 12294 Leicestershire Regiment 20/05/1915 I. D. 1. United Kingdom Lance Corporal 36784 Royal Welsh Fusiliers 31/03/1916 III. A. 7. United Kingdom Private 23585 Sherwood Foresters (Notts and Derby Regiment) 30/05/1916 III. K. 7. United Kingdom Lieutenant Lancashire Fusiliers 03/03/1916 Age: 23 II. R. 9. United Kingdom Private 2646 Black Watch (Royal Highlanders) 26/10/1915 II. D. 1. United Kingdom Serjeant Z/2774 Rifle Brigade 24/12/1916 IV. B. 2. United Kingdom Private 13/939 York and Lancaster Regiment 15/08/1916 Age: 28 III. C. 18. United Kingdom Private 13074 South Lancashire Regiment 12/12/1915 II. F. 11. United Kingdom Private 11794 The King's (Liverpool Regiment) 21/10/1915 II. C. 7. United Kingdom Private 12012 South Lancashire Regiment 17/12/1915 II. G. 7. United Kingdom Private 2189 London Regiment (Royal Fusiliers) 19/06/1915 I. E. 5. United Kingdom Private 3002 Royal Sussex Regiment 30/06/1916 III. Q. 7. United Kingdom Sapper 69284 Royal Engineers 01/05/1916 III. D. 5. United Kingdom Lance Corporal 8079 Hampshire Regiment 23/07/1916 III. M. 13. United Kingdom Private 12631 Welsh Regiment 22/03/1916 III. A. 2. United Kingdom Lance Serjeant 8509 Leicestershire Regiment 24/05/1915 I. D. 4. United Kingdom Lieutenant Royal Welsh Fusiliers 16/01/1916 Age: 27 II. M. 2. United Kingdom Private 23940 West Yorkshire Regiment (Prince of Wales's Own) 27/07/1916 Age: 20 III. H. 13. United Kingdom Lance Corporal 726 Royal Sussex Regiment 30/06/1916 Age: 24 III. C. 9. Indian Sepoy 581 Burma Military Police 13/10/1915 Indian. D. 8. United Kingdom Lance Corporal 942 Sherwood Foresters (Notts and Derby Regiment) 04/11/1915 Age: 30 II. D. 5. Indian Rifleman 1196 4th Gurkha Rifles 17/08/1915 Indian D. 2. Indian Drummer 262 129th Duke of Connaught's Own Baluchis 25/09/1915 Indian. D. 2. United Kingdom Private 5007 Royal Sussex Regiment 30/06/1916 III. S. 9. United Kingdom Private 3180 Sherwood Foresters (Notts and Derby Regiment) 30/11/1915 II. F. 1. United Kingdom Private 3582 London Regiment (Royal Fusiliers) 16/06/1915 I. E. 4. United Kingdom Private 3225 Royal Sussex Regiment 30/06/1916 III. G. 9. United Kingdom Private 20796 Gloucestershire Regiment 24/05/1916 Age: 19 III. H. 5. United Kingdom Second Lieutenant South Wales Borderers 07/02/1916 Age: 23 II. O. 11. United Kingdom Private 15481 Hampshire Regiment 01/07/1916 Age: 21 III. K. 9. Indian Sepoy 280 27th Punjabis 10/10/1915 Indian D. 6. United Kingdom Private 372 Black Watch (Royal Highlanders) 12/07/1915 I. E. 10. United Kingdom Lance Corporal 3267 Worcestershire Regiment 10/10/1916 II. ZI. 5. United Kingdom Private 2066 Seaforth Highlanders 09/05/1915 Age: 25 I. A. 8. Indian Lance Naik 3540 3rd Sappers and Miners 19/10/1915 Indian. D. 9. United Kingdom Company Serjeant Major 280029 London Regiment (Royal Fusiliers) 10/02/1917 Age: 27 IV. C. 3. United Kingdom Private 12749 East Lancashire Regiment 03/01/1916 II. K. 6. United Kingdom Serjeant 752 Sherwood Foresters (Notts and Derby Regiment) 22/11/1915 Age: 26 II. E. 4. United Kingdom Private 18663 Welsh Regiment 30/01/1916 Age: 25 II. O. 1. Indian Rifleman 2296 9th Gurkha Rifles 09/05/1915 Indian A. 4. Indian Sepoy 2761 55th Coke's Rifles (Frontier Force) 27/09/1915 Indian. D. 3. United Kingdom Private 3/2467 Black Watch (Royal Highlanders) 10/07/1915 I. B. 10. Indian Sepoy 2667 89th Punjabis 28/09/1915 Indian. C. 6. United Kingdom Lance Corporal 27328 East Lancashire Regiment 11/08/1916 III. L. 17. United Kingdom Private 15026 Hampshire Regiment 23/07/1916 III. N. 12. United Kingdom Private 1457 Royal Sussex Regiment 30/06/1916 Age: 18 III. R. 10. United Kingdom Private 1195 London Regiment (Royal Fusiliers) 25/07/1915 I. G. 5. United Kingdom Corporal 2343 Sherwood Foresters (Notts and Derby Regiment) 25/11/1915 Age: 22 II. E. 5. United Kingdom Private 306249 Duke of Wellington's (West Riding Regiment) 28/05/1917 IV. H. 3. United Kingdom Private 14/807 York and Lancaster Regiment 28/08/1916 III. L. 18. United Kingdom Private 21718 East Yorkshire Regiment 22/09/1916 Age: 21 II. Z. 6. United Kingdom Private 17789 Welsh Regiment 27/01/1916 II. N. 7. United Kingdom Serjeant 20736 South Wales Borderers 15/02/1916 Age: 23 II. P. 8. United Kingdom Private 4638 Black Watch (Royal Highlanders) 02/07/1916 III. E. 11. United Kingdom Private 19/1216 Durham Light Infantry 16/04/1916 Age: 19 III. C. 4. United Kingdom Private 19039 East Lancashire Regiment 13/04/1916 III. B. 8. United Kingdom Private 283206 London Regiment (Royal Fusiliers) 10/02/1917 IV. C. 6. United Kingdom Lance Corporal 6775 Royal Warwickshire Regiment 25/12/1915 Age: 22 II. J. 4. United Kingdom Private 10586 Wiltshire Regiment 24/07/1915 Age: 18 I. H. 1. United Kingdom Private 4/7236 Bedfordshire Regiment 25/07/1915 I. G. 4. United Kingdom Private 11310 South Lancashire Regiment 11/03/1916 II. S. 11. United Kingdom Private 23/61 Durham Light Infantry 19/05/1916 III. G. 7. United Kingdom Private 13943 Hampshire Regiment 23/07/1916 Age: 20 III. K. 13. United Kingdom Private R/353 The King's (Liverpool Regiment) 20/12/1915 Age: 21 II. H. 9. United Kingdom Private 17758 Welsh Regiment 27/01/1916 Age: 24 II. N. 8. United Kingdom Driver L/17064 Royal Field Artillery 11/08/1916 III. A. 18. United Kingdom Lieutenant Royal Engineers 09/10/1915 Age: 28 II. A. 10. United Kingdom Private 3681 Royal Sussex Regiment 30/06/1916 III. A. 11. United Kingdom Lance Corporal 3687 Royal Sussex Regiment 30/06/1916 III. S. 10. United Kingdom Private 17/584 West Yorkshire Regiment (Prince of Wales's Own) 17/05/1916 III. G. 4. United Kingdom Private 22087 Manchester Regiment 08/05/1916 III. E. 5. United Kingdom Sapper 28854 Royal Engineers 24/03/1917 IV. E. 7. United Kingdom Private 307486 Duke of Wellington's (West Riding Regiment) 03/05/1917 IV. G. 5. United Kingdom Lance Serjeant 111 Royal Sussex Regiment 30/06/1916 Age: 22 III. T. 9. United Kingdom Private 10648 Wiltshire Regiment 25/07/1915 Age: 31 I. H. 2. United Kingdom Rifleman C/3227 King's Royal Rifle Corps 15/07/1916 III. O. 12. United Kingdom Private 16347 South Lancashire Regiment 10/03/1916 II. S. 8. United Kingdom Private 3012 North Staffordshire Regiment 28/11/1915 Age: 24 II. F. 11. United Kingdom Bombardier 3718 Royal Field Artillery 08/07/1916 Age: 22 III. L. 11. United Kingdom Private 14418 Hampshire Regiment 30/06/1916 Age: 25 III. J. 9. United Kingdom Private 3076 Black Watch (Royal Highlanders) 21/05/1915 I. C. 7. United Kingdom Private 17/953 West Yorkshire Regiment (Prince of Wales's Own) 18/05/1916 III. G. 6. United Kingdom Private 18/605 Durham Light Infantry 27/07/1916 Age: 21 III. J. 15. United Kingdom Lance Serjeant 9927 South Staffordshire Regiment 19/07/1915 I. J. 10. United Kingdom Private 11401 Wiltshire Regiment 19/12/1915 II. G. 12. United Kingdom Private 4107 Royal Sussex Regiment 30/06/1916 III. S. 4. United Kingdom Sapper 66147 Royal Engineers 24/05/1916 III. H. 4. Indian Sepoy 712 34th Sikh Pioneers 07/06/1915 Indian. D. 1. United Kingdom Private 15042 East Lancashire Regiment 06/08/1916 Age: 39 III. C. 17. United Kingdom Private 5759 East Lancashire Regiment 06/04/1916 III. B. 4. United Kingdom Private 17/1706 West Yorkshire Regiment (Prince of Wales's Own) 01/08/1916 III. C. 16. United Kingdom Private 15542 Worcestershire Regiment 12/12/1915 II. G. 2. United Kingdom Private 4111 Royal Sussex Regiment 21/06/1916 Age: 19 III. M. 3. United Kingdom Private 3775 Highland Light Infantry 09/10/1915 II. A. 9. United Kingdom Gunner L/17789 Royal Field Artillery 28/07/1916 II. V. 7. United Kingdom Private 19/162 Durham Light Infantry 13/05/1916 III. G. 2. United Kingdom Private 23671 Sherwood Foresters (Notts and Derby Regiment) 30/05/1916 III. J. 4. United Kingdom Private 14/538 York and Lancaster Regiment 11/09/1916 II. Y. 6. Indian Sepoy 4823 59th Scinde Rifles (Frontier Force) 18/08/1915 Indian. A. 3. United Kingdom Lance Corporal 976 Royal Sussex Regiment 30/06/1916 Age: 30 III. R. 4. Indian Rifleman 1423 39th Garhwal Rifles 21/08/1915 Indian. C. 3. United Kingdom Private 492095 London Regiment 01/03/1917 IV. E. 1. United Kingdom Private 18/1481 Durham Light Infantry 27/07/1916 Age: 20 III. Q. 14. United Kingdom Private 19137 Royal Welsh Fusiliers 10/01/1916 II. L. 5. United Kingdom Second Lieutenant Royal Welsh Fusiliers 10/01/1916 II. L. I. United Kingdom Serjeant 29525 Royal Welsh Fusiliers 15/09/1918 Age: 23 V. E. 3. United Kingdom Private 17571 Cheshire Regiment 03/03/1916 Age: 33 II. R. 5. United Kingdom Private 17/413 West Yorkshire Regiment (Prince of Wales's Own) 18/05/1916 III. G. 5. United Kingdom Private 15201 East Lancashire Regiment 12/08/1916 Age: 19 III. B. 18. United Kingdom Private 3699 Royal Sussex Regiment 30/06/1916 III. S. 1. United Kingdom Private 7897 Connaught Rangers 08/11/1915 II. D. 9. Indian Rifleman 2310 9th Gurkha Rifles 24/10/1915 Indian C. 9. United Kingdom Gunner L/16357 Royal Field Artillery 07/08/1916 III. F. 17. United Kingdom Private 18658 Gloucestershire Regiment 30/06/1916 Age: 25 III. T. 7. United Kingdom Private 2802 Royal Sussex Regiment 30/06/1916 III. S. 2. United Kingdom Private 3944 Royal Sussex Regiment 30/06/1916 III. C. 10. United Kingdom Private 2457 Westmorland and Cumberland Yeomanry 02/10/1916 II. X. 5. United Kingdom Private 26735 Devonshire Regiment 09/12/1916 Age: 38 IV. A. 5. United Kingdom Private 18/620 Durham Light Infantry 27/07/1916 III. H. 14. United Kingdom Private 265653 Duke of Wellington's (West Riding Regiment) 12/03/1917 IV. E. 5. United Kingdom Company Quartermaster Serjeant 14190 North Staffordshire Regiment 17/01/1916 Age: 29 II. M. 3. United Kingdom Private 1481 Royal Sussex Regiment 30/06/1916 Age: 18 III. D. 12. United Kingdom Lance Corporal 747 Royal Sussex Regiment 30/06/1916 Age: 24 III. R. 5. United Kingdom Private 479 Royal Sussex Regiment 23/06/1916 Age: 28 III. N. 5. United Kingdom Serjeant 18/140 West Yorkshire Regiment (Prince of Wales's Own) 27/07/1916 Age: 37 III. E. 14. United Kingdom Private 28033 Machine Gun Corps (Infantry) 30/06/1916 Age: 21 III. T. 5. United Kingdom Second Lieutenant Welsh Regiment 09/05/1915 Age: 19 I. B. 2. United Kingdom Private 19128 Royal Welsh Fusiliers 16/07/1915 Age: 19 I. H. 10. United Kingdom Lance Corporal 12/1487 East Yorkshire Regiment 25/07/1916 III. A. 14. United Kingdom Private 26803 Welsh Regiment 14/12/1915 II. G. 1. Indian Jemadar 124th Duchess of Connaught's Own Baluchistan Infantry 28/08/1915 Indian. D. 1. United Kingdom Private 14/1218 York and Lancaster Regiment 11/09/1916 Age: 20 II. Y. 5. United Kingdom Private 13461 East Lancashire Regiment 02/01/1916 II. K. 4. United Kingdom Rifleman R/12176 King's Royal Rifle Corps 27/12/1916 IV. B. 3. United Kingdom Private 33142 Royal Welsh Fusiliers 15/02/1916 Age: 22 II. P. 7. United Kingdom Private 2761 Worcestershire Regiment 24/08/1916 III. K. 18. United Kingdom Private 5273 Royal Warwickshire Regiment 17/10/1915 Age: 22 II. C. 6. United Kingdom Private 14865 King's Own (Royal Lancaster Regiment) 06/01/1916 Age: 36 II. K. 9. United Kingdom Private 6448 Army Cyclist Corps 10/01/1916 Age: 26 II. L. 3. United Kingdom Private 11930 Worcestershire Regiment 13/01/1916 II. L. 11. United Kingdom Private 17/539 West Yorkshire Regiment (Prince of Wales's Own) 19/04/1916 Age: 32 III. C. 6. United Kingdom Second Lieutenant Worcestershire Regiment 10/10/1916 Age: 27 II. ZI. 2. United Kingdom Private 24036 Gloucestershire Regiment 04/06/1916 Age: 19 III. L. 3. United Kingdom Private 3338 London Regiment (Royal Fusiliers) 20/06/1915 I. F. 1. United Kingdom Private 28015 Machine Gun Corps (Infantry) 30/06/1916 III. T. 6. Indian Sepoy 558 28th Punjabis 26/09/1915 Indian. D. 5. United Kingdom Lance Corporal 2094 London Regiment (Royal Fusiliers) 23/06/1915 I. F. 4. United Kingdom Private 10/407 East Yorkshire Regiment 17/09/1916 Age: 22 II. Z. 2. United Kingdom Private 2185 Suffolk Regiment 21/06/1915 I. G. 6. United Kingdom Lieutenant Welsh Regiment 09/05/1915 Age: 21 I. B. 1. United Kingdom Private S/7078 Black Watch (Royal Highlanders) 21/07/1915 I. J. 3. United Kingdom Private 265578 Duke of Wellington's (West Riding Regiment) 12/03/1917 Age: 22 IV. E. 3. United Kingdom Private 14038 Hampshire Regiment 22/06/1916 III. N. 3. United Kingdom Rifleman 2915 London Regiment (Queen Victoria's Rifles) 26/11/1916 Age: 20 IV. A. 1. United Kingdom Lance Corporal 18/245 West Yorkshire Regiment (Prince of Wales's Own) 27/07/1916 II. V. 10. United Kingdom Private 22675 Royal Welsh Fusiliers 08/01/1916 Age: 19 II. K. 11. United Kingdom Lieutenant Royal Warwickshire Regiment 20/12/1915 Age: 24 II. H. 6. United Kingdom Private 5204 Royal Sussex Regiment 30/06/1916 Age: 19 III. H. 11. United Kingdom Private 14705 Lancashire Fusiliers 13/06/1916 Age: 34 III. L. 8. United Kingdom Second Lieutenant East Lancashire Regiment 11/08/1916 Age: 23 III. M. 17. United Kingdom Sapper 96365 Royal Engineers 31/05/1916 Age: 28 III. K. 4. Indian Captain 39th Garhwal Rifles 12/05/1915 I. B. 3. United Kingdom Corporal 11890 Machine Gun Corps (Infantry) 22/06/1916 III. M. 6. United Kingdom Private 19762 Gloucestershire Regiment 30/06/1916 III. M. 9. United Kingdom Private 18/1127 West Yorkshire Regiment (Prince of Wales's Own) 27/07/1916 II. V. 9. United Kingdom Private 20938 Welsh Regiment 16/02/1916 Age: 18 II. P. 9. United Kingdom Private 4437 Worcestershire Regiment 20/10/1916 Age: 21 II. V. 3. 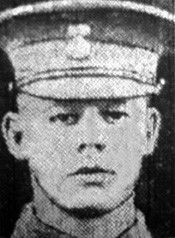 United Kingdom Private 2034 London Regiment (Royal Fusiliers) 23/06/1915 Age: 27 I. F. 3. United Kingdom Corporal 12961 South Lancashire Regiment 23/02/1916 Age: 22 II. Q. 6. United Kingdom Lance Corporal 5230 Manchester Regiment 22/10/1915 II. C. 8. United Kingdom Private 7036 Leicestershire Regiment 29/05/1915 I. D. 5. United Kingdom Captain Lancashire Fusiliers 13/05/1916 III. F. 7. United Kingdom Private 12426 South Lancashire Regiment 10/04/1916 Age: 37 III. B. 7. United Kingdom Private 19978 Lancashire Fusiliers 08/05/1916 III. E. 2. United Kingdom Private 21072 Welsh Regiment 09/02/1916 II. P. 2. United Kingdom Private 22519 Lancashire Fusiliers 22/03/1916 Age: 17 II. U. 10. United Kingdom Private 4865 Connaught Rangers 02/10/1915 II. A. 7. United Kingdom Serjeant 6245 Royal Engineers 03/11/1915 Age: 31 II. D. 3. United Kingdom Private 21483 Hampshire Regiment 30/06/1916 III. N. 9. United Kingdom Serjeant 23751 Sherwood Foresters (Notts and Derby Regiment) 30/05/1916 III. J. 2. United Kingdom Second Lieutenant York and Lancaster Regiment 05/09/1916 Age: 22 II. W. 5. United Kingdom Private 18/1247 Durham Light Infantry 27/07/1916 Age: 24 III. N. 14. United Kingdom Private 11848 Leicestershire Regiment 15/06/1915 Age: 25 I. E. 3. United Kingdom Private 283058 London Regiment (Royal Fusiliers) 12/02/1917 Age: 22 IV. D. 2. United Kingdom Private 21053 East Yorkshire Regiment 22/09/1916 II. Z. 4. United Kingdom Private 18/1471 West Yorkshire Regiment (Prince of Wales's Own) 14/09/1916 II. X. 3. United Kingdom Private SD/3710 Royal Sussex Regiment 30/06/1916 Age: 27 III. Q. 1. United Kingdom Private 18943 Wiltshire Regiment 18/03/1916 II. U. 1. United Kingdom Private 3047 Royal Sussex Regiment 30/06/1916 Age: 35 III. E. 9. Indian Major Indian Medical Service 09/05/1915 Age: 38 I. A. 2. United Kingdom Private 38943 Royal Warwickshire Regiment 08/09/1918 Age: 20 V. B. 2. United Kingdom Private 2223 Royal Sussex Regiment 30/06/1916 III. B. 12. United Kingdom Private 22094 Manchester Regiment 08/05/1916 Age: 20 III. E. 7. United Kingdom Serjeant 6767 Connaught Rangers 02/10/1915 II. A. 5. United Kingdom Private 12/724 East Yorkshire Regiment 25/09/1916 II. Z. 5. United Kingdom Private 18074 Cheshire Regiment 03/03/1916 II. R. 8. United Kingdom Private 2810 Suffolk Regiment 21/06/1915 I. F. 9. United Kingdom Corporal 2770 Worcestershire Regiment 10/10/1916 II. ZI. 3. United Kingdom Private 17125 Cheshire Regiment 14/04/1916 Age: 23 III. C. 1. United Kingdom Private 16873 South Lancashire Regiment 04/04/1916 Age: 20 III. B. 2. United Kingdom Private 26429 Royal Welsh Fusiliers 07/02/1916 II. O. 9. United Kingdom Private 23802 Royal Welsh Fusiliers 24/01/1916 Age: 21 II. N. 3. Indian Sepoy 3610 107th Indian Pioneers 30/10/1915 Indian. D. 10.